When Captain Alex Marcase’s estranged father dies, he hopes his inheritance will be enough to fund his next deep space expedition. When his inheritance turns out to be a genetically-altered slave named Evan, it’s just the beginning of the end of Alex’s normal, orderly life. Not only does Evan have his own brand of morality, his special abilities are coveted by his late owner’s enemies. As the pair head into deep space with their enemies in hot pursuit, Alex’s chief rival ahead of them, and a saboteur onboard their ship, will they be able to learn to appreciate each other as individuals in time? Or will their differences be too much to overcome? Keeper has not been tagged yet. 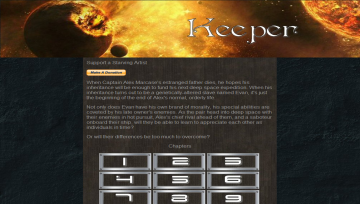 Help others find Keeper by tagging it! Keeper has not been reviewed yet. Keeper has not been recommended yet.